Vos is an ancient Velothi farming village on the eastern coast of Vvardenfell, near Tel Mora. There are few services here. There is a Dunmer chapel which is too small to serve as a focus for Almsivi intervention, but the resident cleric, Yakin Bael, is a fine healer, and worth a visit by anyone interested in the medical arts. A harbor lies downhill from the town, where there are ships to Tel Aruhn, Sadrith Mora and nearby Tel Mora. 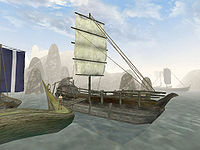 The large and friendly Varo Tradehouse is located near the wharves, and is a good alternative to Tel Mora for travelers seeking accommodation. Apart from passing through on the way to Master Aryon's tower at Tel Vos, there is little cause to visit Vos. The houses in the village have a strange architecture, a blend of Telvanni mushroom and stone. A mushroom to the southeast hosts the Varo Tradehouse, providing beds and sundries. Hairan Mannanalit offers some training there. Maela Kaushad in her farmhouse is a wise woman. The Chapel is the only Temple of the Tribunal deep in Telvanni teritory and a recent addition to the town, providing healing services to all. Yakin Bael is the master trainer in Restoration, and Eldrilu Dalen is a spellmaker. Dirt roads lead west to Tel Vos and southeast into the Grazelands to the stronghold Indoranyon and the Velothi tower Hanud. Tel Mora is very close to the east across the water. 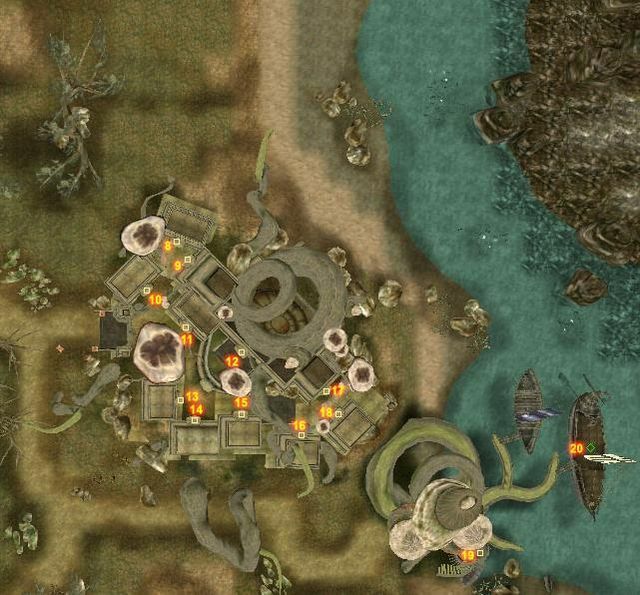 The Falvillo's Endeavor at the docks can take you to Sadrith Mora, Tel Aruhn, and Tel Mora. The ship also makes a nice home. Vos makes a good starting point for hunting the free-roaming Daedra in the Grazelands. The Temple in Vos is not a potential target for Almsivi Intervention. The wizard tower of Master Aryon, Tel Vos, is just up the hill. The Dwemer ruins of Nchuleft are straight to the west, at the foot of the mountains. The Ahemmusa Camp is directly north of Vos.